The New Metropolitan Police Force - September, 1829. The new Force came into being on the 29th of September, 1829, on which date the first units were seen on the streets. “The Rules and regulations for the guidance of the New Police, who commence their duties on Tuesday next, have been published, and seem admirably calculated to create a system of effective protection to the Public. Of the Metropolitan District, five divisions have been selected for immediate supervision. To each division a Police Company is assigned, and a smaller Police Company is attached to the office of the Commissioners, to be applicable for general purposes. The plan of operations is founded on the division of labour. Each division is divided into eight sections, each section into eight beats. The area to which the new system is to apply, at present, embraces all the space westward from the city boundaries to Chelsea, and north and south from the New-road to the river Thames. Taking in Pimlico, Park-lane, the Edgware-road, and Paddington, and all the intermediate parishes. The lowest in the scale is the Police Constable, whose pay is twent-one shillings a week, subject to certain deductions for clothes and lodging. This sum would, of course, on any scheme excluding promotion, be utterly inadequate to secure good conduct in London; but, on the present scheme, it will be better than a larger sum, because it will supply more forcible motive to the Constable to exert himself to attain that promotion which is held out to him, as well as to earn the extraordinary rewards assignable to meritorious conduct, as proved by the state of the spot placed under him. In the army, the soldier is assured of nothing but his pay and his pension; but then the duty of the soldier is mere force and bravery. But the Police Constable has a difficult duty assigned to him. 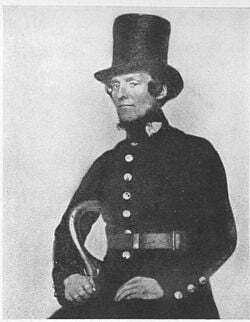 He is very properly told in these instructions, that:- “every Police Constable in the Force may hope to rise by intelligence and good conduct to the superior stations; it is therefore recommended to each man to endeavour, by studying these instructions, and by reflecting upon the nature of the duty he has to perform, to qualify himself for such promotion. But, at the commencement, he will most certainly recommend himself to notice by the diligent discharge of his own duties, and a strict obedience to the commands of his superiors, recollecting, that he who has been accustomed to submit to discipline, will be considered best qualified to enforce it hereafter. “It is, likewise, indispensably necessary that he should make himself perfectly acquainted with all the parts of his beat or section – with the streets, thoroughfares, courts, and houses. He will be expected to possess a knowledge, also, of the inhabitants of each house. The Serjeant is responsible for the general conduct and good order of the nine men he has under him, so that to promote his advancement he has the strongest motive for conciliating their good-will and being just towards them. The Inspector has under him four Serjeants and 36 men, and he again is responsible for their general conduct and good order; and it is expected of him that he shall make himself well acquainted with the talents and general moral conduct of each individual. The Superintendent of the Division has a wide range of duty, and consequently an exclusive responsibility. We have not the slightest doubt that if this Plan be strictly acted on, – punishment and promotion regularly, and not capriciously adjudged, being taken as the levers, the result must ere long be beneficial. The thing is new in this country, for we have no model in anything public of an Institution founded on merit. The difficulties they will have to struggle with, in the outset, will be great no doubt, because all the old officers whose interest was in the encouragement of crime, will endeavour to thwart them. The practitioners at the Old Bailey, too, whose incomes mainly depend on there being a good amount of property put in circulation by thieves and swindlers, will be very much on the alert to avail themselves of a popular prejudice to discredit the new men. The thieves themselves are clever people, and necessity will sharpen their wits, because a good Police will necessarily improve the thieves in their trade. Still, we trust much to the efficacy of organization. In time the other great towns will avail themselves of the best parts of the scheme. We conclude with repeating our approbation of the scheme as a whole. It is highly creditable to those who framed it, and is equally creditable to Mr. Peel, who, if he had no hand in the framing of the Instructions, is at least entitled to the merit of judgment in bestowing his approbation on them. When so much property is exposed, and so much necessity and ardent passion come in contact with it, there will always be crime; but we would fain hope that the trade of a thief will not be so good as it has been.